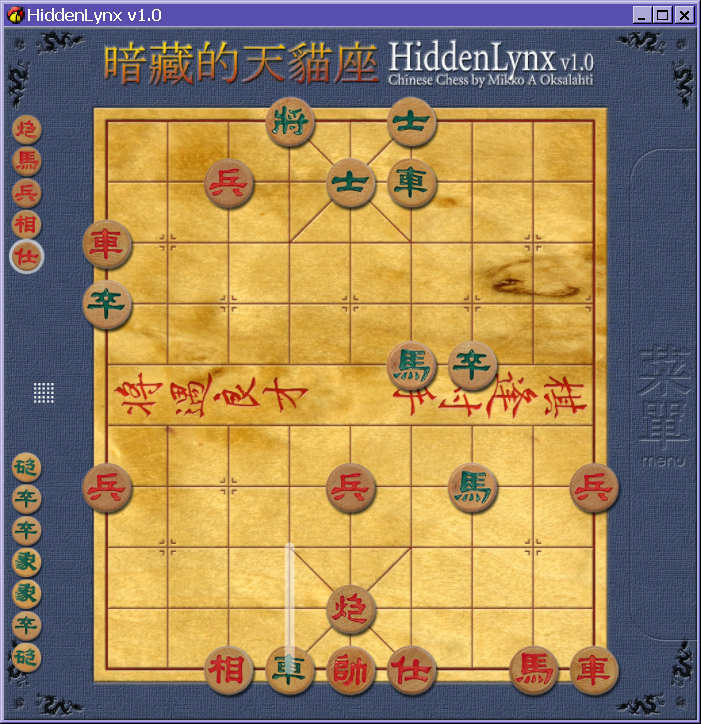 Invented by Mikko A. Oksalahti, HiddenLynx is a beautiful, user-friendly, freeware Chinese Chess program for Windows that plays a good game. It includes unlimited undo and redo, lets you drag pieces with the mouse, shows you which legal moves are available, and saves games automatically. Overall, it is a great program for Chinese Chess. Note that the menu is on the right, not where it is in most Windows programs. The game ends with capture of the General, not with checkmate or stalemate. Author: Fergus Duniho. Inventor: Mikko Oksalahti. HiddenLynx . A beautiful, user-friendly, Windows program for Chinese Chess.